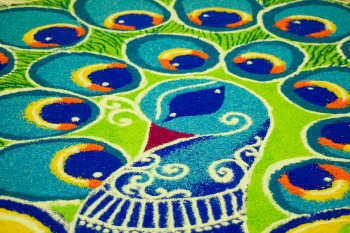 A rangoli is a colourful design made on the floor near the entrance to a house to welcome guests. At Diwali, Hindus draw bright Rangoli patterns to encourage the goddess Lakshmi to enter their homes. 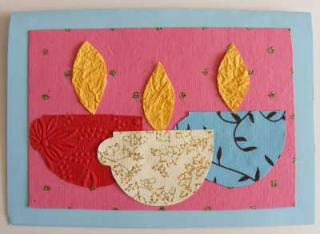 We've got a fun matching rangoli pattern activity - and more rangoli puzzles coming soon! 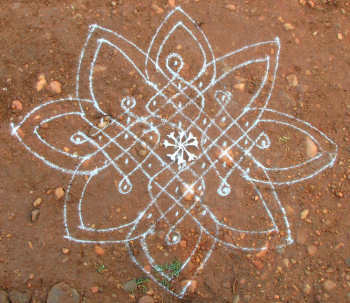 Rangoli patterns are traditionally drawn with the fingers using flour, rice grains or coloured chalk. 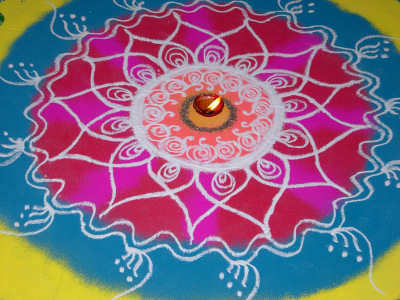 Rangoli can be square, rectangular or circular – or a mix of all three. They are often symmetrical. Rangoli motifs are usually taken from Nature - peacocks, swans, mango, flowers and so on. Rangoli were originally done in small patterns of about 2 foot square, but now entire areas of floor can be covered in intricate designs, often produced by first drawing gridlines in light chalk. 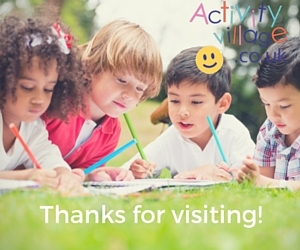 We have a number of suggestions below for creating Rangoli designs, suitable for children of all ages and abilities. Rangoli come in all shapes and sizes! Before you make your own it is a good idea to have a look at a variety of different examples - perhaps you could print some out to look at with your children or sit at the computer together. 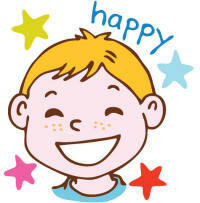 We have lots of ideas for making your own rangoli on our rangoli crafts page as well as rangoli posters to print.